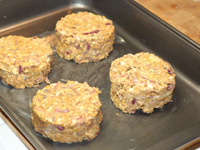 These mushroom and lentil cakes are as healthy as they are tasty. Low GI, low in fat and a great source of protein for vegatarians. Cook the lentils in boiling water for 10 minutes, skim off any scum then simmer for a further 15 minutes. 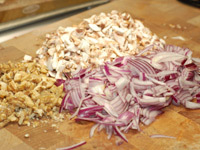 Meanwhile finely chop the onion, mushrooms and walnuts. 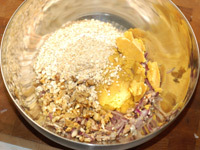 Drain the lentils, then when cooled combine with all the other ingredients in a mixing bowl. Use your hands to mix the ingredients together. Lightly grease a baking tray with a little butter. Form the mixture into four evenly sized cakes using a pastry cutter or similar and place them on the greased baking tray. Cook at 190°C/380°F/Gas Mark 5 for 25-30 minutes. 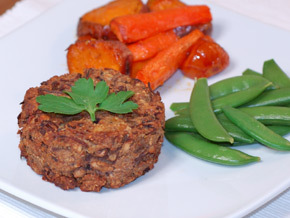 Roast some sweet potatoes, carrots and cherry tomatoes and serve together with the cakes and sugar snap peas. They are particularly good when served with vegetable gravy.